Since the 1990s, scientists have been warning that if global temperatures rise 2.0 degrees Celsius above pre-industrial levels, climate change will become so disruptive as to threaten civilization as we know it. Many scientists now think that 1.5 degrees is the outer safe limit. Since Earth is already about a degree warmer than at the beginning of the industrial revolution, and, according to Bill McKibben, Trump’s administration will add another degree, the two degree limit seems almost certain to be exceeded. What will this bring? Most of us have heard about various tipping points and feedback loops to come, about droughts and floods, resource wars, epidemics, coastal innundations, and mass migrations. Anyone who follows climate news will also know that part or all of the tropics may become uninhabitable. However, we hear next to nothing about future political arrangements except as science fiction. Geoff Mann and Joel Wainwright, both professors of Geography, consider how climate change may fundamentally reshape societies. They ground their projections in Marx and Gramsci, and in Hobbes, who maintained that human beings collectively dread civil war more than anything else. To avoid a war of all against all, people invest power in a sovereign who can maintain the peace. Hobbes called this sovereign “Leviathan”, or the multitude united in one person. For Hobbes, Leviathan was a king. For Carl Schmitt Leviathan was Hitler. Schmitt was a 20th century German political theorist who admired Hobbes, and whom Mann and Wainwright cite frequently. Other Leviathans are possible, including democratically elected ones, and Leviathans consisting of groups of peers. The authors ask what sorts of sovereigns climate change will bring about. Or alternatively, is it possible that climate change will allow for the emergence of social systems without sovereigns, systems such as our hunter-gatherer ancestors had, and, contrary to Hobbes, many indigenous peoples still have today? Mann and Wainwright make the necessary disclaimers – our knowledge is imperfect, we cannot know the future, and so on – but predict that waves of climate-caused shocks and disruptions will undermine and eventually destroy enough of our present-day arrangements that new kinds of sovereigns will emerge. The authors do not spell out these sacrifices, except to say that “ways of life and communities will be lost” and that Leviathan “will determine whose lives will be sacrificed in the universal interest.” How many lives will be lost? Thousands? Millions? Billions? Would Climate Leviathan maintain oases of affluence in a wrecked Earth? Mann and Wainwright do not engage in such speculation, but assure us that many of today’s elites already favor something like Climate Leviathan, which they see as a means of retaining their wealth and power. Like all sovereigns, Climate Leviathan would aim for hegemony, and could conceivably achieve it for an enormous span of time through geo-engineering, in particular solar radiation management (SRM). SRM involves injecting sulfate aerosols into the atmosphere to modify Earth’s albedo. These synthetic aerosols would reflect sunlight away from Earth’s surface, and if all went well, would lower temperatures. The operative word here is “if”. SRM is rife with uncertainties. It would be a radical experiment on the planet, undertaken so that we do not have to fundamentally change our political-economic system. Under the umbrella of SRM, the capitalist system, which is predicated on unlimited growth, might continue to pour greenhouse gases into the atmosphere, and thus lock our species into managing Earth’s atmosphere for millenia. A second response to climate change could be Climate Behemoth. Unlike Leviathan, which would be global and in some circumstances might heed science and observe democratic forms, Behemoth would be nationalistic, authoritarian, and impervious to reason. Arguably a form of Behemoth has come into being in the US today under Trump, whose power rests on an alliance between those portions of the capitalist class with ties to fossil fuels, and allies among the middle and working classes who are nationalistic and dependent on fossil fuels for jobs and inexpensive goods and services. The authors consider Climate Behemoth to be Leviathan’s primary contender. Behemoth’s greatest strength is its greatest weakness: it substitutes rhetoric and blind faith in markets and technological unicorns for serious efforts to limit climate change. Islam, according to the authors, tends toward Behemoth. They quote bin Laden to suggest that an Islamic Behemoth might respond to climate change with religious justifications for terror and unrestricted killing of nonbelievers. This possibility deserves careful study, but the authors do not provide it. They devote only a few pages to religion. A third possible future is Climate Mao, or “a non capitalist authority along Maoist lines… [that uses] just terror in the interests of the future of the collective.” The appeal of Climate Mao is that it might answer the need for very rapid state-led reductions in greenhouse gas emissions in time to avoid the worst outcomes. 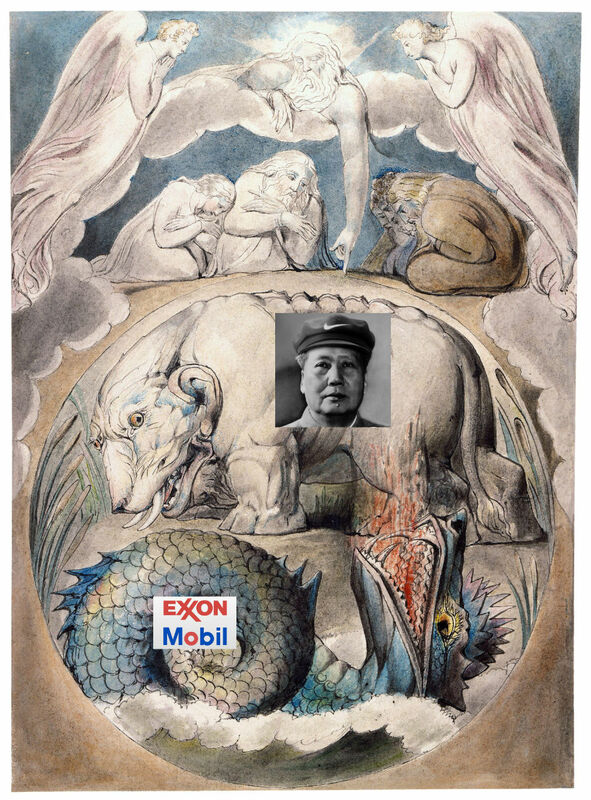 At present China is moving toward capitalism, which would imply a Chinese Leviathan or Behemoth. However, according to the authors Climate Mao could still arise in China. The fourth and last possibility, which the authors favor even while acknowledging its improbability, is Climate X. This would be “a just response” characterized by equality, inclusiveness, and solidarity without sovereignty. Diverse expressions of Climate X can be found in Naomi Klein’s This Changes Everything, Pope Francis’s Laudato Si, writings and statements of indigenous peoples, and the climate justice movement. Two social forces (not including the religious response to climate change represented by Pope Francis) lead to Climate X. The first is the left. Mann and Wainwright do not define the left, but focus on the part of it with roots in Marxism. The second force is indigenous experience and views of the world. Indigenous views have nothing to do with Marxism, and, according to Russell Means, an Ogalla-Lakota activist, are in some respects opposed to it. Means considered Marx too narrowly European. “Marx despiritualized Hegel’s work… Europeans may see this as revolutionary, but American Indians see it simply as still more of that same old European conflict between being and gaining… The European materialist tradition of despiritualizing the universe is very similar to the mental process which goes into dehumanizing another person.” How the left and indigenous peoples, who are extremely diverse, can coordinate efforts over the long term is far from clear. The climate justice movement is not one thing, but a cloud of groups, actions, and upwellings of concern. The problem with both the climate justice movement and Climate X is not their aspirations for justice and a liveable planet but the old political challenge of getting from here to there. Climate justice movements have had local successes, but are not yet politically strong enough to achieve very much for climate on the national and international levels. Still, climate justice movements may be instrumental in building consciousness, articulating concerns, and developing proposals that in a crisis could be adopted on the necessary scale. Mann and Wainwright acknowledge that Climate X has little chance of realization, and yet insist that “Climate X is absolutely necessary.” Their attitude reminds me of attitudes of artists who devote themselves to expressing possibilities that might otherwise remain without form. But the authors do not discuss the arts, and evidently do not see themselves as allied with artists. If anything, they distance themselves, as when they scorn “Hollywood’s aestheticization of anxiety and panic” and its ”dystopian commodities.” Mann and Wainwright would do well to see more disaster movies. The arts, even when grossly commodified, can operate in mysterious ways. Which brings me to the one major flaw in an invaluable book. Mann and Wainwright recognize that a central failing of the left today, at least in the US, is that it does not provide a believable vision of how to deal with climate change. However, they burden their search for a fresh vision by over-reliance on Marx and some of his successors, such as Gramsci and Benjamin. Relevant as they can be, to blame climate change entirely on capitalism is a serious mistake. Capitalism threatens the biosphere, but the Soviet Union also produced environmental disasters and massive greenhouse gas emissions. The authors do not acknowledge this. The USSR and other socialist states offer compelling evidence that the problem of climate change goes beyond capitalism, and is due also to industrialism and its forms of technological innovation, along with population growth. Mann and Wainwright argue persuasively that we need a new conception of the political. Yet here too they limit their search by adhering too faithfully to the Marxist left. In a heating world, the left’s concern for justice remains essential, but even more important is survival, human, and – most important of all – the long-term well-being of the biosphere. This is self evident, but clearly needs to be underscored. The ultimate question is not which humans will suffer, or whose historical grievances will be addressed, or whether green capitalism is a contradiction in terms. Urgent as these questions are, the ultimate question, and the measure of other concerns, is how much of the biosphere will endure. Without a biosphere, all our other concerns are moot. Mann and Wainwright recognize that as disaster piles on climate disaster, many people will resign themselves to Climate Leviathan as the least appalling alternative. This is already happening. However, it does not mean that we cannot simultaneously pursue Climate X. What we face, according to the authors, is a “crisis of the imagination.” Again, art comes to mind. Mann and Wainwright also use the language of the spirit when they call for “ideas of futures that can guide us in dark times.” Considering the immense problems that we face, we would do well to claim that language, even – especially – if it means grounding the spiritual in science and the natural world. The work of Paul Shepard and other deep ecologists, along with many artists, poets, and Buddhists indicate that this can be done. Climate Leviathan is a work of disciplined thinking and scrupulous scholarship. The authors are attentive to implications of their findings, even when these are extremely grim. This takes courage. We are accustomed to being coddled when it comes to climate predictions. Gloomy facts and figures are routinely followed with sunny possibilities – green futures, economic bonanzas from low CO2 technologies, and so on. Call it kneejerk politics, or call it the Al Gore technique – it’s what he famously did in An Inconvenient Truth – it is not what we need today. With climate change, optimism is a cardinal sin. Climate Leviathan is an essential book. I recommend it to anyone concerned about the future. However, it would have been an even better book if it were less nostalgic for lost certainties of the left. That would have made its panorama of the future even darker, but simultaneously may have revealed more than four political possibilities. Others that come immediately to mind: our extinction, ecological theocracies, Denmark-like hybrids of capitalism and socialism, and population crash and return to a patchwork of localized social orders. No doubt there are many other possibilities, for better and for worse. The time has come to imagine as many as we can. Most may be improbable, but perhaps no more than Climate X.